‘The what?’ I hear you ask. Well, we decided that we wanted to provide affordable, high quality tuition at Chicken and Frog and we do. But the reality is that there is still a weekly cost for families which means that it is not an accessible service for everyone. This makes me sad, so we hatched a plan, way back in the summer of 2012 (before we’d opened for business). We applied to Brentwood Council for part of the Brentwood Share Fund, asking for a sum of money which would enable us to provide 12 x 1 hour sessions for 10 families. Each family is provided with 12 x 1 hour tuition sessions in English or Numeracy (they choose each time), a free Learning Library, 10% discount on all books and a dedicated parents’ forum on our website. They even get a biscuit and a cuppa! 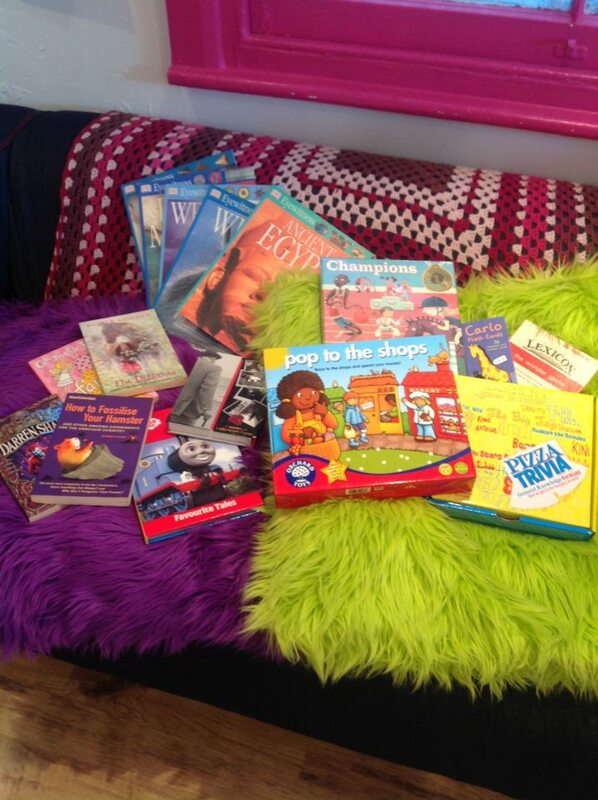 Just a small selection of games and books to borrow. As I have said, our first session was this morning. We shared ideas with parents and their children, to try out at home. I even got my SMART board up and running so that we could share some of the fabulous FREE resources that are out there. I am delighted that the project is now and up running and am very much looking forward to seeing it go from strength to strength. We are willing to re-run this project for as long as there is a demand for it. Although the funding itself won’t be renewed (it’s a one-off pot of money), we have spent wisely on long term resources and are more than happy to provide our teaching time purely for the joy of supporting our community. Next Post Is Easter the new Christmas?